Last week, Iranian leader Ayatollah Ali Khamenei addressed a meeting of Iranian university students and, in his first public comments on the ongoing assault on Gaza, spoke of his belief in the necessity of continued Palestinian resistance to Israel aggression, oppression, and occupation. "Don't the Palestinians have the right to defend their lives and security?" he asked rhetorically, and condemned Western nations like the United States and Great Britain for openly supporting Israel's assault and justifying "crimes that no ordinary person would." In the right-wing Daily Caller, notorious neocon darling Reza Kahlili noted that Khamenei reiterated the call by his predecessor, Ayatollah Rouhollah Khomeini, that "Israel must be destroyed," adding that "until that time with the help of God for this cruel and murderous regime to be destroyed, strong confrontation with steadfast armed resistance is the only solution against this destructive regime." Yet the Caller omitted a crucial aspect of Khamenei's speech - deliberately replaced by an ellipsis linking the the paraphrased Khomeini quote with Khamenei's endorsement of Palestinian armed struggle - in which the Iranian leader stated that the ideal solution to the current impasse was a democratic vote. The missing piece, however, was reported by other outlets. "There are logical and practical means to this end, which is for people who live and belong there to pick the government of their choice through a referendum. That would be the end of a usurping fake regime," Khamenei said, according to a translation by Reuters. Until that time, he continued, "while waiting for an end to this cold-blooded murderous regime, mighty armed resistance is the only way to deal with it." Only through a vote by the indigenous population, Khamenei said, will "the usurper and forged regime" of Israel "be practically annihilated." Kahlili's report predictably expunged all mention of a referendum, focusing instead on Iranian military capabilities and nuclear negotiations. More troubling, perhaps, is that "The Young Turks," a liberal (some might even say, progressive) news and commentary outlet led by host Cenk Uygur, promoted the Daily Caller line in their own round table discussion of the matter. After hearing a portion of the Kahlili article read aloud verbatim, co-host Ana Kasparian described Khamenei's comments as "extremely violent" and "crazy," while John Iadarola called such statements "depressing." Reuters also quoted Khamenei as saying, "Israel's annihilation is the only real cure, but that doesn't mean destroying Jews in this region," a statement also ignored by the Daily Caller. With this comment, Reuters editorialized, "Khamenei made clear for the first time that he was talking about the dismantling of the state of Israel, not the death of Jews." While such clarification is important, the characterization of that distinction as being a new addition to Khamenei's rhetoric is curious. In fact, this is a distinction made often by Iranian officials when discussing this very topic - and Iran's official position toward Israel/Palestine. Cursory research into past statements quickly reveals the consistency of such statements and proves the Reuters claim to be, not only sloppy, but ludicrous. A similar presumption was made last year in the wake of then-newly-inaugurated Iranian President Hassan Rouhani's insistence that, "when it comes to the settlement and resolution of regional issues," including the colonization and occupation of Palestine, "we believe that the only path is through the ballot box, through democracy." International news media declared this to be a breakthrough moment, despite the clear fact that Rouhani's immediate predecessor, the much-maligned Mahmoud Ahmadinejad, had made identical statements throughout his eight-year tenure as president. "We are opposed to the idea that the people who live there should be thrown into the sea or be burnt," Ahmadinejad said in comments reported by the New York Times in September 2008. "We believe that all the people who live there, the Jews, Muslims and Christians, should take part in a free referendum and choose their government." More to the point, however, Khamenei himself has remained remarkably consistent on this issue, and Iran's official prescription, for over two decades. In an extensive analysis of Khamenei's speeches since 1990, published in the Boston Review in November 2013, well-known Iranian dissident Akbar Ganji - no fan of Iran's theocratic leadership - revealed the truth: Khamenei has long called for a new, inclusive Palestinian government to supersede the current Zionist one, thereby dismantling what is currently known as "Israel" politically, not violently. For instance, Ganji notes, on April 17, 1991, Khamenei discussed "his solution for the Palestinian problem and said, 'The Islamic Republic's solution is to disband the usurping Zionist regime, forming a government of the Palestinians, and [guaranteeing] peaceful co-existence of Jews, Christians, and Muslims in all of Palestine.'" Four months later, on August 19, 1991, Ganji adds, Khamenei stated, "Solving the Palestinian problem entails destroying and eliminating the illegitimate government there, so that the true owners [of the land] can form a new government; Muslims, Christians, and Jews can live side by side... Our view regarding the Palestine issue is clear. We believe the solution is destroying the Israeli regime." Nearly a decade later, Khamenei's position had not shifted. In a speech to the Basij militia on October 21, 2000, Ganji tells us that Khamenei again laid out his vision for the indigenous people of Palestine to choose their own political path forward. "The solution is for the millions of the Palestinians to return to Palestine, the several millions that live away from home to return to Palestine. The indigenous people of Palestine—Jews, Christians, and Muslims—should hold a referendum to decide what kind of a regime they want. The vast majority are Muslims. There are also Jews and Christians that belong there, as their parents also lived there. They can decide the political system that they favor," he opined. In March 2002, Khamenei again stated, "Holding a referendum in Palestine among the Palestinians, and all those that became refugees—if, of course, they want to return to Palestine—is a rational solution." In June 2002, he repeated, "The only solution for the Palestine problem is that the true Palestinians, not the usurping and occupying immigrants, those who live in Palestine and those who became refugees, decide the type of government that they want. If asking for the vote of the people of a nation is a solution for those who claim to be democracy advocates, [then] Palestine is also a nation and must decide [its fate]." The Palestinian problem has only one solution, and that is what we proposed several years ago. Hold a referendum among the indigenous Palestinians, those who live there, or are in refugee camps, or live elsewhere, regardless of whether they are Muslim, Christian, or Jew, and ask them to decide the government that they want. Regardless of whether that government is run by the Muslims, Jews, or Christians, as long as it is the result of people’s direct votes, is acceptable, and will solve the problem. Without it [the referendum] the problem will never be solved. That Reuters would now claim Khamenei's recent comments about Gaza mark a stark break from the past is absurd. In his Friday prayer sermon on June 20, 2008, Khamenei declared, "No, we have no problems with Jews. We have no problems with Christians, and with adherents of other religions in the world. The usurper is just the Zionist regime. This is the position of our state, and that of our revolution and our people." 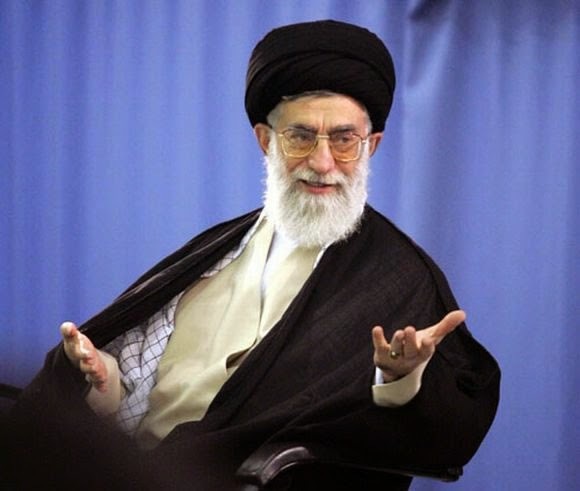 Similarly, on September 30, 2011, Khamenei spoke at a conference in support of the Palestinian struggle for freedom, justice, and self-determination, and said, "We neither advocate a classic war between Israel and the Islamic countries, nor throwing the Jewish people into the sea, and neither do we accept mediation by the United Nations or any other international organization. We propose a referendum among the Palestinian people. Similar to any other nation, the Palestinians also have the right to decide their fate and pick the type of government they want." All the Palestinians – both the current citizens of Palestine and those who have been forced to immigrate to other countries but have preserved their Palestinian identity, including Muslims, Christians and Jews – should take part in a carefully supervised and confidence-building referendum and chose the political system of their country, and all the Palestinians who have suffered from years of exile should return to their country and take part in this referendum and then help draft a Constitution and hold elections. Peace will then be established. Regardless of whether Khamenei's proposals are realistic, idealistic, inevitable or impossible, is irrelevant. That he has consistently called for a referendum to alter the exclusivist and discriminatory political system that controls Palestinian lives and has routinely made distinctions between the Zionist government in Israel specifically and Jewish people in general, is indisputable. Reuters should get their facts straight. November 9, 2014 - A series of tweets from the official Twitter account of Iranian leader Ayatollah Khamenei reiterate his long-held belief that a referendum, not genocide or military assault, should determine the future of Israel/Palestine. But that's not how it's being presented in the media, of course. For instance, a predictably smug article in Slate, headlined, "Iran’s Khamenei: No Cure for Barbaric Israel but Annihilation," notes that a 9-step table posted online outlines "his plan to destroy Israel." Similarly, Maria Khan of Britain's International Business Times wrote that Khamenei "took to Twitter... to map out precisely how to wipe out Israel off the global map." The right-wing hub for lunatic idiots Newsmax calls the plan "chillingly detailed." What these articles point out only tangentially and (seemingly) begrudgingly, is that - while Khamenei clearly would like to see a new government preside over the lives of all those living within the borders of historic Palestine - the word "annihilate" is misleading, and deliberately alarmist. The only means of bringing Israeli crimes to an end is the elimination of this regime. And of course the elimination of Israel does not mean the massacre of the Jewish people in this region. The Islamic Republic has proposed a practical & logical mechanism for this to international communities. This "mechanism" - while perhaps unfeasible and unrealistic - and is anything but groundbreaking or newsworthy at this point. It's the same thing Khamenei and other Iranian leaders have been saying for years. "All the original people of Palestine including Muslims, Christians and Jews wherever they are, whether inside Palestine, in refugee camps in other countries or just anywhere else, take part in a public and organized referendum." Khamenei excludes "Jewish immigrants who have been persuaded into emigration to Palestine" from his proposed voter base. Until such a political solution is reached, Khamenei promotes the use of "powerful confrontation and resolute and armed resistance" to oppose Israeli occupation and colonization. "The West Bank must be armed like Gaza," the proposal suggests. Back in July, Khamenei said effectively the exact same thing. Keep up the great research, brother!